Azerbaijani Energy Minister Natig Aliyev has said drafting of two documents under the Trans-Caspian gas pipeline project is drawing to a close and they must be signed by Azerbaijan and Turkmenistan's presidents and head of the European Commission, as well as the governments of the two Caspian littoral countries. Aliyev told media Wednesday that the first document will feature the support to the project by the three sides, while the second one must be signed between the Azerbaijani and Turkmen governments. "We have conducted several meetings in this regard and now one can say that the documents are ready," Aliyev said, adding that only a few issues are to be clarified. The minister noted that Turkmenistan has expressed its support for the project implementation. This means the Turkmen side is ready to deliver around 30 billion cubic meters of gas for the project. 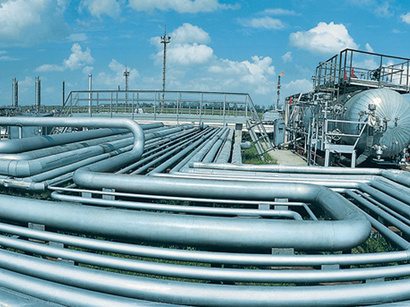 In turn, Azerbaijan is ready to ensure all conditions for the transportation of Turkmen gas. Aliyev said that the total cost of laying the gas pipeline was estimated at $3 billion in the 1990s, but now the situation has changed and the cost has increased. "Construction of the section of the gas pipeline through the Caspian seabed alone may require $1-2 billion," he said. The minister stressed that the Trans-Caspian Gas Pipeline is an important project within the Southern Gas Corridor and the project was re-submitted to the agenda by the European Union. Earlier, head of the European Union Delegation to Azerbaijan Roland Kobia stated that the EU believes that it is in the interest of Turkmenistan and Azerbaijan to be able to develop the Trans-Caspian Pipeline. He said that the EU is still holding discussions with Azerbaijan and Turkmenistan on the issue. However, it is noteworthy that Iran and Russia oppose the pipeline project. Tehran and Moscow believe the pipeline construction may damage the Caspian Sea's environment. Russia also brings up the unresolved status of the Caspian. According to Kobia, however, the EU does not believe that the unsettled legal status of the Caspian is an obstacle. According to him, firstly, there are no legal reasons for this. If the project implementation is discussed, then, according to Kobia, it should be discussed between Baku and Ashgabat, and the matter should not concern other coastal states. Turkmen President Gurbanguly Berdymukhamedov earlier said at a cabinet meeting that the Turkmen government exercises a responsible approach to international cooperation in the energy sector, implementing major projects in the field of gas transportation, as well as promoting its international initiatives in the field of overall energy security. Azerbaijan also expressed its readiness to provide its territory, transit opportunities and infrastructure for the project as previously representatives of the state energy company SOCAR said at an energy conference in Ashgabat. The United States also has a positive attitude towards the Trans-Caspian Gas Pipeline project. "We, of course, back this project and are ready to render any possible assistance for its implementation. I hope that the joint efforts of Azerbaijan, Turkmenistan and Turkey will lead to a positive result," U.S. Ambassador to Azerbaijan Richard Morningstar earlier said. Trans-Caspian Gas Pipeline running around 300 kilometers will be laid from the Turkmen coast of the Caspian Sea to Azerbaijan, where it will be linked to the Southern Gas Corridor. The pipeline with capacity of 30-40 billion cubic meters of gas per year will open for Turkmen gas a "direct" (through the territory of Azerbaijan, Georgia and Turkey) path to the EU markets, which means that the supply will not involve the pipeline network of Russian monopoly Gazprom, to which Turkmenistan has no free access. Negotiations on the construction of the pipeline between Turkmenistan, the EU and other countries have been held since the late 1990s. The negotiation process intensified after the European Union delivered a mandate to start negotiations on the preparation of an agreement between the EU, Azerbaijan and Turkmenistan on the Trans-Caspian project in September 2011. The Southern Gas Corridor is a major energy project for the EU. It is designed to diversify the routes and sources of energy supply and aims to ensure the EU energy security. The gas to be extracted during the second stage of developing Azerbaijani Shah Deniz field is being considered as the main source for the Southern Gas Corridor projects.